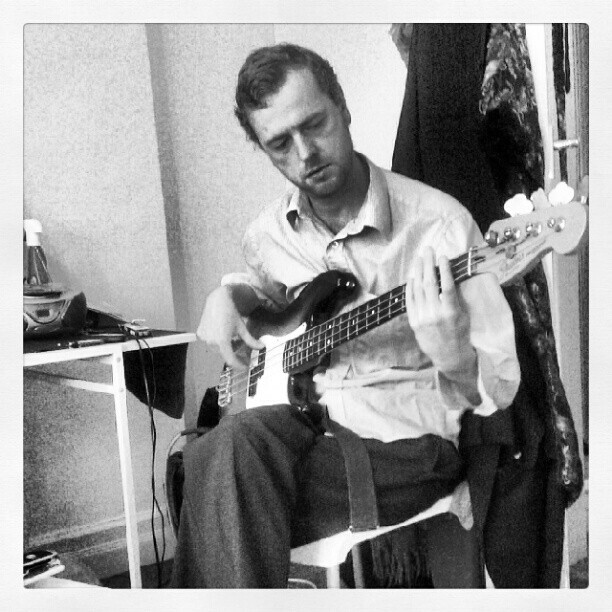 This moody fellow is Tom Evans, Leika’s new bass player. This picture was either taken in a dressing room or a bed room. Perhaps a dressing room room with a bed. Regardless of furnishing concerns, Tom joins us from our old chums, Guido Sol. Hailing from Derby, Tom is the second member of Leika to come from north of the Watford Gap. A very capable player with professional experience, he very much has da phunk, and adds a wonderful plonking clarity to our rhythm section. Tom has already been with us for around three weeks, and will be joining us for the first time at the Comedy, near Leicester Square, on 13th September. He responds particularly well to references to Davie Bowie’s ‘Space Oddity’. Tom has promised to join his bandmates for post-gig light refreshments. We look forward to that.